This is a fan site. This site is not affiliated in any way to Dell. To obtain a position in the IT Field where I am able to continue utilizing my skills and expertise to further corporate business development. More than Ten Years of Experience in a Leadership position as an IT Manager. Proficient in Crystal Report writing, BO Server Administration and Visual FoxPro Application Design and Development. Experienced in Visual Basic .NET, VB Script, SQL, various Web and Enterprise Technologies including; Website Design, Oracle EBS Administration, Microsoft Office, Access, Exchange and Open Office. Master of Science & B.S. in Civil Engineering. Managing a Team of 3 Employees, in an environment with 13 Servers and 110 networked PCs, providing full support to all IT needs of the company, including Level II/III Technical Support to resolve advanced, escalated issues for more than 250 end users. In charge of determining what projects to accomplish per year, managing these projects within an available annual budget. Created more than 100 Crystal Reports for Kewill Max for Windows (ERP), approximately 50 Reports for Oracle EBS with an estimated market value of around $200,000 and a few reports for Abra for Windows Human Resource solution. Developed 7 Database Systems in Visual FoxPro 9 covering: Accounting, Document Controls, Inventory and the History Files being migrated to VFP from Max for Windows. Coordinated the project management in the implementation of Oracle EBS and developed all the code needed for the Data Migration from Pervasive SQL to the necessary data structures required by Oracle, this reduced the cost of the implementation in 17%. Responsible for the Administration of the Oracle EBS Enterprise Resource Planning System. Recommended and Supervised the implementation of Abra for Windows and ADI Time Employee Biometric Time Management System, drastically reducing human error, the amount of time spent manually calculating payroll and attendance problems. Developed VFP tools needed for the analysis of Labor Data integrated between ADI Time in Microsoft SQL 2000 and Oracle MES based on Oracle Databases, helping in the Efficiency and Cost Control. Reduced operational costs by implementing VMware Virtualization Systems, saving in overall hardware cost. Supervised the creation and implementation of IT Policies including E-mail and Internet Use Policies. Supervised the migration from Windows XP to Windows 7 and trained all users in the use of this Operating System. Having the same software and hardware in all clients PC reduced the support cost in 40%. Implemented a video surveillance system with 16 video CCTV cameras around the building remotely controlled from a PC. Converted 7 FoxPro for DOS applications to Visual FoxPro. Creating Database Systems in Clipper, Foxbase and Visual Fox Pro. Teaching Computer Basis – How to use Windows, Office, Internet, etc. Responsible for the construction of Hydraulic and Civil Structures (Drains, Reservoirs, dams, channels, etc.) in Cuba. Moskovskij Meliorativnij Institut, Moscow, Russia. In my own time, I created Tweaks2k2 (http://www.tweaks2k2.com/), an application in VB .NETCF for PocketPCs and worked as a freelancer and news editor for http://www.todoumpc.com/, http://www.mobilitysite.com/ and http://www.ultramobilepc-tips.com/. Since 2007, I have been awarded by Microsoft for 4 consecutive years as Most Valuable Professional (http://www.tweaks2k2.comhttp://www.tweaks2k2.com/). Probably I'm not supposed to talk about it here but what the heck, Dell abandoned me on this matter so... I installed WM6.1 in my Axim X51v and I'm glad that I did it. It's like I bought a new Pocket PC. My Axim works faster than when it was using the so called "legal" WM5 ROM from Dell. One of the reason why I have not done it before was because many of these 3rd parties ROM do not work well with .Net applications and in my work with Tweaks2K2 that's really important. But these ROM have gone a very long way from the point of view of quality. The one I'm using does not have to envy anything to any of the ROM released by Dell in the past. Tweaks2k2, 3 times winner in the last 3 years! An "unsupported" version of WM6 has been released for x51v at xda-developers. 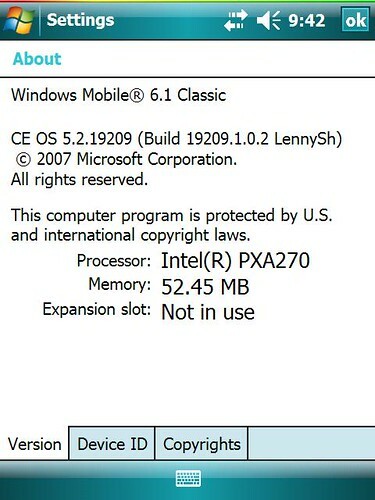 Some .NET applications, including Tweaks2K2, have been known to have problems or do not work at all in these ROMs. Unfortunately in these cases there is nothing that we can do about it. First off, sorry for the delay on this. In addition to recent coverage by blogs like Engadget, jkOnTheRun and others, I’ve gotten a few e-mails and a comment from Direct2Dell reader David H. Deans who’ve asked me to confirm whether we’ve discontinued the Axim line or not. The answer is yes, we have. Gadgetmix has just posted a review of Tweask2k2 for Pocket PC. Tweaks2k2.net is great application, which makes registry editing a child's play. Tweaks2K2 - 2 times finalist! 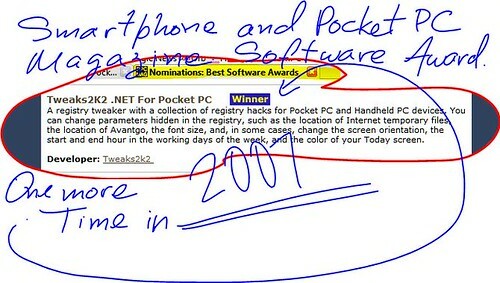 I was just reading JKonTheRun a few minutes ago when I found that Tweaks2K2 won the Pocket PC and SmartPhone Awards this year in the System and Registry Category in it's two versions for Pocket PC and SmartPhones!